Keeping Up With the Kontinuity Errors: Lamar's in the Hospital, But Who Can Tell? Teenager Kylie Jenner lounges alone at her Calabasas home. Interrupting her meditative moments, her mother, Kris Jenner, enters with four boxes of pedestrian Krispy Kreme doughnuts. Kylie is overjoyed and even snapchats her mom’s delivery. Because they are good people, Kris and Kylie give one of the four boxes to the dozen or so grown men working on Kylie’s pool in her backyard. Kylie is nervous to give the doughnuts to the men herself and makes Kris go out there because, “you’re like a woman and I am like a little child.” You hear that, Tyga?? I have no doubt that those three extra boxes did not go to waste in Kylie’s home. If there’s one thing we know about those Kardashian/Jenners, it’s that they love gorging on processed doughnuts! Kris’ delivery was filmed on September 11, 2015. The dream team is at it again. Kris Jenner takes her youngest daughter and proud homeowner, Kylie Jenner, shopping for bathroom appliances. Kylie immediately falls in love with a sink and a very naughty toilet that had a bidet which is a grower and not a shower. Kylie decides on that toilet. Kylie’s toilet dreams came true and this scene was filmed on August 6, 2015. At Kris Jenner’s house, Kris Jenner is doing a photoshoot for a British magazine. Mother to the stars is a star herself decked out in glam and posing for her life, honey! During a break, Kim comes through to immediately complain about a couple of things. First up is Kris’ new workout equipment. Kim is upset that her mother bought all new equipment when she could have just had Kim and Kanye’s, which they were looking to sell. The young couple is swapping out their black equipment for grey. Kris can’t really help her at this point so she heads down to her shoot. Kim, who is surprisingly quick for someone in their third trimester, stops Kris in her tracks to discuss the most important issue. According to Kim, Kris halted her and Kanye’s home design plans by stealing a few slabs of Calacatta Gold Marble. Now they’ve hit a roadblock because this marble is extremely rare and they either have to break their backs finding additional slabs for the two bathrooms lacking this particular look, or redo every other bathroom in the house. Kim already tried to move forward with the marble deficit and even changed Kanye’s whole bathroom. However, she’s still pissed at her mom for taking 6-10 slabs of this important marble and not even paying for it. Kris isn’t having it and bets Kim 1 million dollars that she can find this marble easily. Wow, y’all. Will we ever be blessed enough to fight about European marble? I sure hope so. Let’s keep one another in our thoughts and prayers. This remarkable scene was filmed on October 28, 2015. Kourtney, Penelope, and Kris visit Kylie house, where Kourtney asks for a tour. While looking around, Kourtney gives Kylie some home styling tips. Kylie also shows Kourtney her new toilet. Kourtney is super hype on Kylie’s new home and offers to plan an extravagant housewarming party. Kylie isn’t feeling a big party and wants to plan something chill. Kris chimes in and agrees with Kourtney. Both talk about various types of miniature food, desserts, sushi and valet for the event. Kylie shuts them down once again and reminds them that she wants to do this herself and start building her own traditions. Like the Cold Open, was filmed on September 11, 2015. Khloe is at cover shoot for Redbook magazine. Honey looks amazing, but she doesn’t feel amazing. Khloe is stressed about meeting the deadline for her book, DASH buying, press and other Kardashian obligations. She’s also pissed that her mom and manager doesn’t seem to care about her emotional or mental state, and Kris Jenner is running late for the shoot, which is delaying the process. Once Kris arrives, Khloe shoots, only after telling her mom not to speak to her throughout the whole process. Afterwards, Khloe and Kris have a sitdown. Kris immediately puts on her gold plated sunglasses in a windowless room and listens to Khloe as she tells her mom to cancel at least one of her obligations coming up. Khloe doesn’t think of this as a big ask because she never asks for anything to be cancelled and she is clearly overbooked. Kris does not seem to care because Khloe agreed to the schedule and they already went over every detail. Nothing really seems to get resolved so Kris leaves and tells Khloe to mentally go to her happy place and eat something. Sadly, Khloe’s obligations were cancelled because this was filmed on September 29, 2015, a couple of weeks before Lamar Odom was rushed to the hospital. 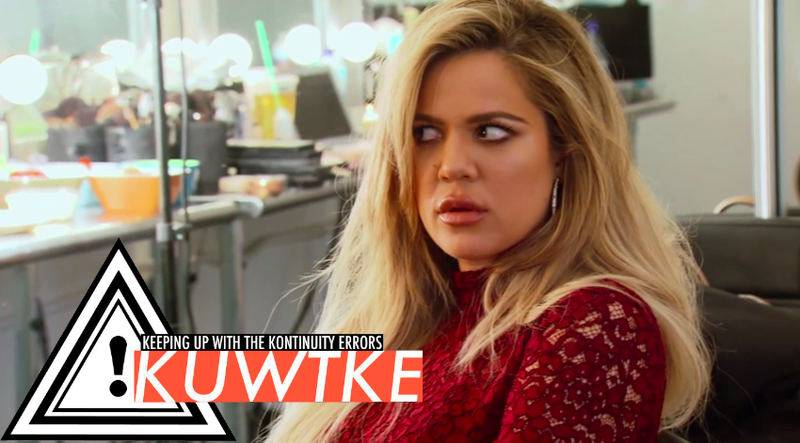 Oddly enough, Khloe’s energy throughout the episode, which were the literal days leading up to Lamar’s hospitalization, makes it seem as though she anticipated a life size curve ball that would take her out of the game for a while. Yikes. At Khloe’s house, Kim is over and Kris Jenner also pops in. Kim, who is scrolling through Instagram, asks Khloe why Rob posted a photo of her with purple hair. Khloe assumes it’s because she cursed him out earlier so he felt bad. Jealous of Rob’s kind treatment towards Khloe, Kim wonders why Khloe gets purple hair and Kim gets that “girl from Gone Girl.” Kris chimes in and tells her daughters that she has set up a meeting with a communications specialist to teach the girls how to not be on their phones so much. The communications specialist is a college friend of Kourtney’s and it will be like a little workshop in detaching from their devices. Kim calls this “the dumbest thing she’s ever heard,” but both she and Khloe agree to attend. As this is what we over at KUWTKE an “inside day” for the sisters, it’s a blessing that Kim referenced Rob’s instagrammed and then deleted pic of Khloe. Because of that photo we know that this scene was filmed on September 22, 2015. Kim and Kourtney are at Khloe’s house for their communications meeting. Shockingly, Kris Jenner is nowhere to be found because she went off to kiki in Paris. Not so shockingly, she also took an old outfit of Kim’s with her which she is wearing that day. The girls are upset because Kris organized this whole thing and couldn’t even manage to show up for it. Kourtney’s friend, and the communications specialist, Erica arrives. She dives right in by having the sisters each tell one another what they love internally about each other. Khloe goes first and tells Kim that she loves her honesty, and Kourtney that she loves her strength as a mom. Kourtney tells Kim that she admires her strength to be able to do it all (Kim agrees) and Khloe’s positive energy and ability to be in the moment. Kourtney says she is usually in a good mood, except for recently she’s been a little cranky. Unfortunately for us, Kim’s moments of appreciation for her sisters were not aired. What were they, Kim? Do tell! Thankfully Kris Jenner stepped out in public wearing Kim Kardashian West’s hand me downs, so we know that this was filmed on October 3, 2015. Kim visits a downtrodden Khloe at her home. Khloe is stressed about all of her obligations and calls writing a book “the most annoying thing ever.” She is also annoyed at her mother and New York Times Bestselling author, Kris Jenner, for continually asking why Khloe needs to read the book she’s writing so many times with each new edit. Kim empathizes with Khloe feeling overwhelmed, but urges her to live the wholistic “mind, body, and soul” mantras she’s detailing in her book. In one of the saddest lines ever spoken on this television program, Khloe sighs, “when do we ever live it?” Despite this, Kim tells her to just take some time for herself and focus on the positive. Both Kim and Khloe are in the same glam and locations as Scene 9 which means that this scene was also filmed on September 22, 2015. Calabasas’ youngest homeowner, Kylie Jenner, hosts her chill housewarming party for her family. She says that she only invited people day of, so it’s a small gathering with Kris Jenner, Corey, Kourtney, Penelope, Kim, and Khloe. Things are pretty chill, just like Kylie wanted, until her sisters, Khloe and Kourtney get into a food fight. Literally no one else is enjoying themselves while the two spread sour cream and guacamole all over one another. Interestingly enough, though, Khloe makes a point to either keep her hood up or or strategically place her hair behind her shoulders as to not reveal her newly short hair, which would be inconsistent with her look throughout the whole episode. Kylie’s dinner and Kourtney and Khloe’s food fight was filmed on November 12, 2015. Kim and Kourtney decide to punish their mother, Kris Jenner, for not showing up to their communications meeting. So, at Kris Jenner’s house, the two set up a dunk tank in her backyard and make whip cream pies to smash in their elderly mother’s face. While making pies, Kourtney mentions that Khloe is sick and couldn’t make it. Kris arrives, ready for a communications meeting redux and is shocked to see the contraption set up in her backyard. When she asks what is really up, they tell her she has issues communicating so they ask her questions, and for each one she gets wrong they either try to break a water balloon over her head or throw a pie in her face. They ask her to name Kim’s due date and North’s middle name; Kris gets each question wrong. This scene was filmed on November 4, 2015.